Heat ghee in a wok, add mustard seeds and urad dal. Fry until mustard splutters and urad dal starts to brown. Add slit green chillies, curry leaves and fry them for few seconds. Add finely chopped onion and fry until they become light brown. Add tomatoes. Fry for 2-3 mins. 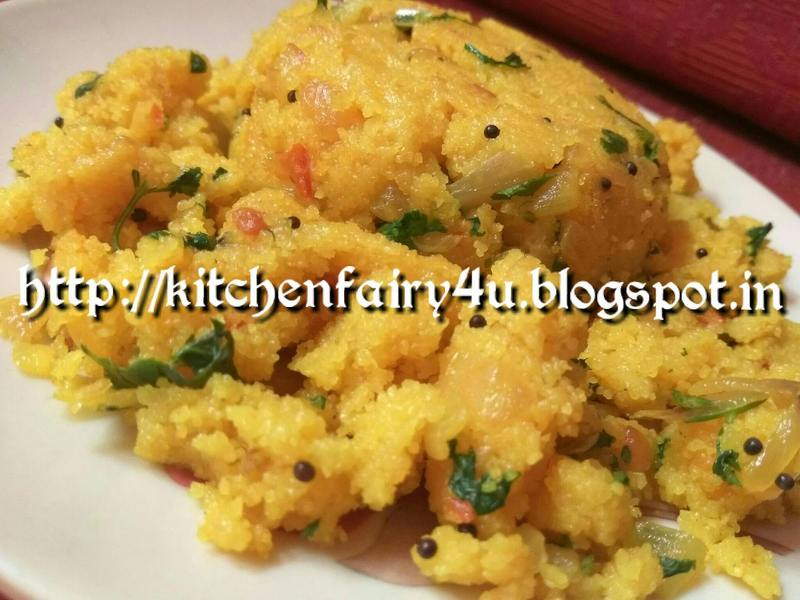 Add haldi powder.Then add semolina and fry on slow flame for about 10-15 mins. Keep stirring. Then add salt, boiling water and mix well. Cook covered on a medium flame until semolina gets cooked. Switch off flame. Immediately add 1-2 tsp of ghee and 2-3tbsp of chopped coriander. Mix well. Serve hot.